Indietutes is a big fan of refashioning/upcycling old garments (YAY!) so the top pictured here is actually remade from an old adult shirt. 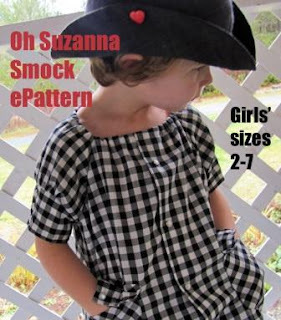 "The Oh Suzanna Smock pattern is one of my favorites because the pattern was drafted to facilitate a reconstruction from an adult shirt. I am a big fan or reusing or upcycling previously loved garments. Not only does it cut down the resources used but worn, well washed garments contain fewer chemicals than new fabric, which is treated with a variety of potently toxic substances (flame retardants, starches, dyes and such). Also, if you have a child who is sensitive to fabrics, previously worn materials feel softer on the skin." So BE QUICK if you want a chance to download and try this pattern for free- you only have until April 19th!!!! P.S check out her Etsy shop too if you like her pattern style. I really like the Willow Wayfarer Hipsters for Slimsters and at $4.00 USD its really affordable! P.P.S This is NOT a sponsored post - all view's expressed here are purely my own and totally uninfluenced by ANY outside parties. Being a part-time working mum sewing on a limited budget I love to share free (and cheap) pattern information, in the hope of helping out others in similar financial situations! what a little gem of a blog and thanks for the heads up on a cute pattern.